Before I got married, I had never eaten an artichoke–one that didn’t come out of a can anyway. And then for our first Christmas together, my husband’s grandmother gave us a set of artichoke plates. By this time, I knew that artichokes were well liked by my husband’s family, but I was still intrigued that they merited special plates. This eye-catching produce always struck me as difficult to handle and daunting to prepare, but I quickly learned that the process need not be cumbersome. The resulting taste and texture are altogether different than what comes out of a can and will make artichokes the highlight of any meal. In fact, I’ve ordered artichokes in restaurants that undoubtedly took far more time and effort to prepare, and I always return to the following steaming method that is mostly hands-off and keeps the extras to a minimum. If, like me, you didn’t grow up eating artichokes, precisely how to eat them can seem almost as intimidating as cooking them. The process, however, is quite simple and makes for a fun dinner. The large vegetable will take up most of your plate and is considered finger food. (Botanically speaking, an artichoke is a flower, but it’s often classified as a vegetable because of the way it’s consumed.) Start by pulling off the outer petals, one at a time, and then dip them in melted butter or sauce before scraping off the “meat” with your teeth. The remaining petal is discarded. Eventually, you’ll work your way to the center, where the prized heart is found. The heart is essentially a thick, cupped circle at the base of the artichoke, and it’s covered by a fuzzy, inedible choke. Simply scrape off the choke with a knife or spoon and discard, and then cut the heart into pieces, dip into the sauce, and enjoy. I used to serve artichokes as a side dish but more recently have made them the main course. They’re quite filling and somehow command a starring role. If they are all you’re having, you may wish to allot two per person. Any leftovers are delicious served cold and are always welcome. My husband’s family likes to dip the petals in melted butter, switching to mayonnaise for the cold leftovers. My mother-in-law adds a squeeze of lemon juice to the butter or mayo, while my kids and I reach for plain mayo or a simple Dijonnaise whether served hot or cold. Though I’ve tried many, no fancy sauce ever seems to beat the basics with my crew. Below the recipe, however, I have included some easy options that you may enjoy trying. For a restaurant-style presentation, use a sharp knife and slice the top half-inch off the artichoke. Then snip the thorny tip of each petal with scissors or kitchen shears. Note: this step is purely optional, as the thorny tips soften when cooked. I think they look pretty as is, so I skip this step. I typically trim the stem end so the artichokes will sit upright on the plate. That said, there is good “meat” inside the stems, so you may wish to leave them on. When buying artichokes, look for ones that feel firm and heavy for their size. If they feel spongy, pass them by. Also, take a peek at the stem end. If it looks brown and dry like it was cut weeks ago, it probably was! When finished, use tongs to remove to a plate and serve with melted butter, a dollop of mayo, or sauce of choice. *In lieu of a steamer basket, I have used a small cooking rack. You need something to keep the artichokes just above the water line. Inexpensive stainless steel steamer baskets can generally be found in the baking/gadget area of the grocery store. Frost-kissed Artichokes: During colder months, artichokes may appear bronze-tipped or have a flaky appearance thanks to frost exposure. These artichokes are often called “frost-kissed” and are considered to be the most tender and flavorful. To tell the difference between an artichoke that has been frost-kissed and one that may be bruised or past its prime, gently scratch the brownish flakes with your fingernail. If the flakes peel off, it’s likely frost-kissed. 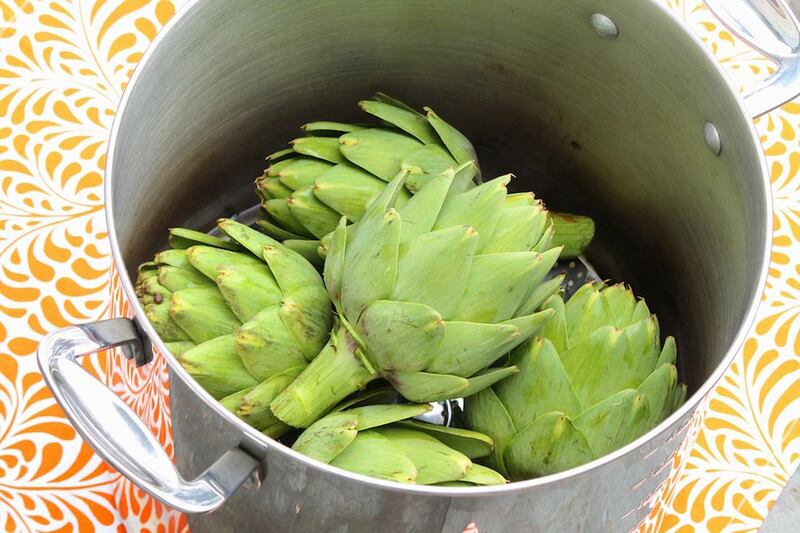 Storing Artichokes: To store fresh artichokes at home, sprinkle them with a little water and refrigerate in an airtight plastic bag. Do no wash before storing. They should last a week when stored properly. 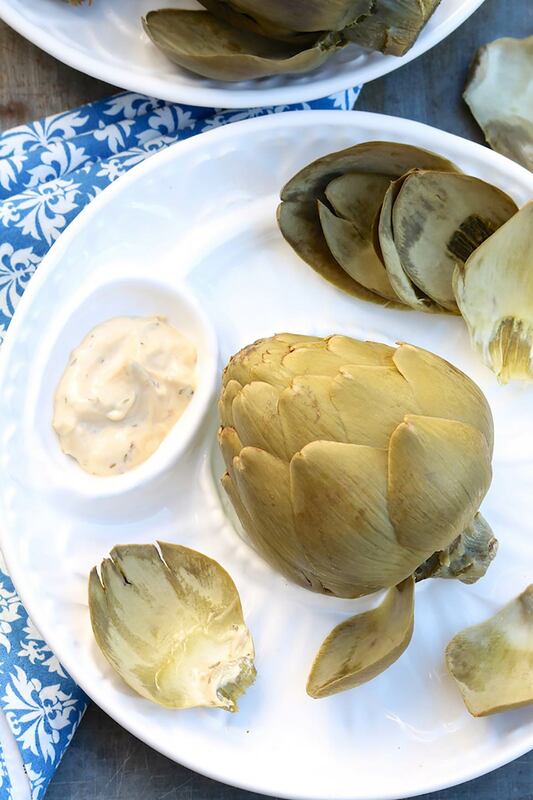 Baby Artichokes: If you are lucky enough to find them, you’re in for a treat. 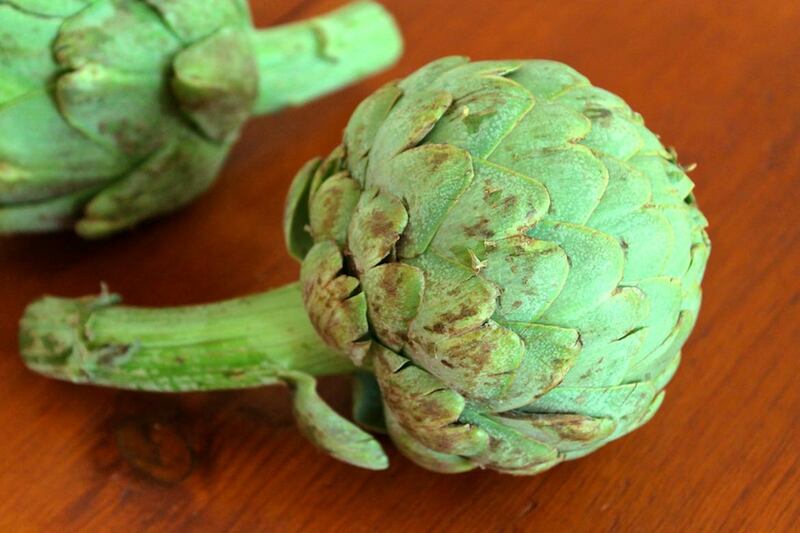 Until I tried them, I had always subscribed to the bigger-is-better theory with artichokes. However, the baby variety has no fibrous choke, just the edible heart. The inner petals are even tender enough to be eaten whole. The artichoke is a perennial vegetable in the thistle group of the sunflower family and originated in the Mediterranean. Artichokes are a significant source of vitamin C, folic acid and magnesium. 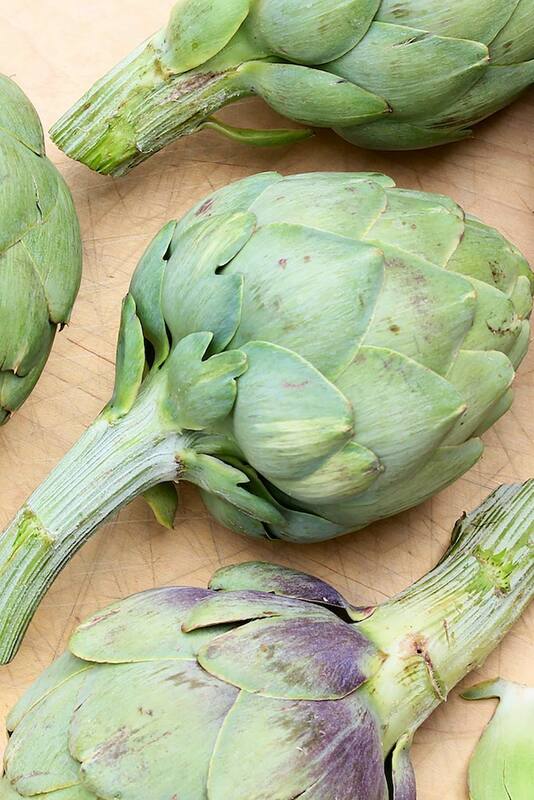 Virtually fat-free, the artichoke weighs in at 25 calories per medium artichoke and is low in sodium. Artichokes are technically flower buds that have not yet bloomed. The Greeks and Romans considered artichokes to be an aphrodisiac. One artichoke plant can produce more than 20 artichokes per year. Baby artichokes are small but fully formed artichokes that grow lower on primary stalks. 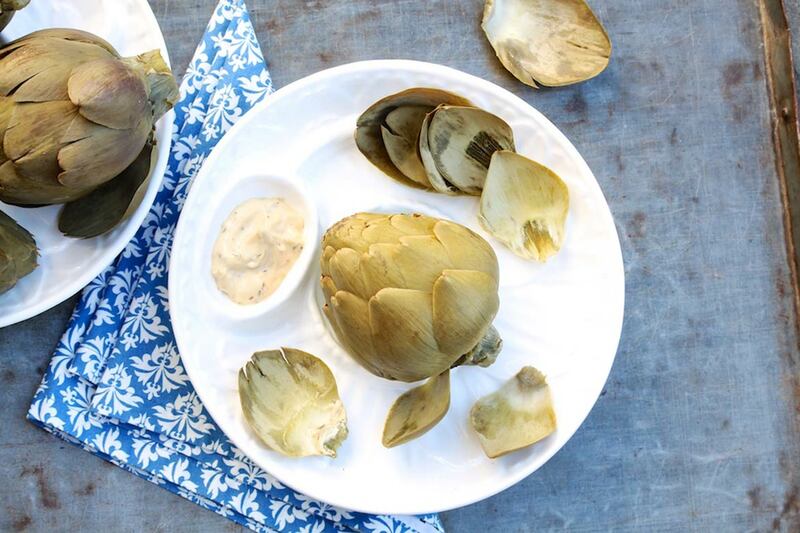 Apparently, Americans are divided on the favorite dipping sauce for artichokes. Eastern state residents prefer butter while Westerners opt for mayonnaise or aioli (garlic mayonnaise). Growing up, my grandmother always brought artichokes to Thanksgiving and Christmas dinners. They were plain and served with butter. However, when she made them for a meal at her house, she used a seasoned bread crumb filling in them. Once prepared, cutting off tips and stem, they would be cooked in plain, salted water until about 2/3’s done. Spread artichoke leaves apart and fill with seasoned bread crumbs and a sprinkle of olive oil to top. Continue cooking until done. We continue to enjoy these today, now that I am the grandmother!! I bet the memories are as delicious as the artichokes, Helen. Your grandmother’s method of preparing sounds divine, and I love that you are now the grandmother cooking these and making memories for your family! My pleasure, Beverley! They really are so very easy. Now we just need a batch of your amazing cupcakes for dessert! I eat my artichokes with Heinz 57 and butter sauce. Does anyone eat this sauce? I’ve never tried, Linda. Thanks for mentioning!